Arguably the Denny Creek Trail is the most popular trail in the state, up to the first mile where the water slide is. 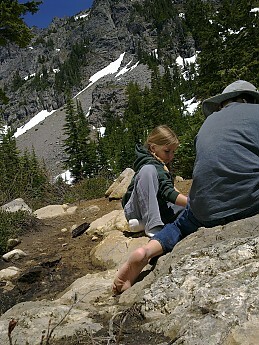 After that, we contimnued another few miles planning to camp at Melakwa Lake for the night. 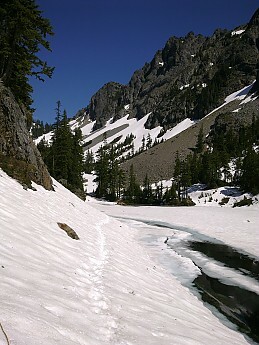 I don't know why but every time I go out this Summer I am surprised again at the amount of snow still left. This lake is only 4,500 ft and this is LATE JULY! When we first arrived at the lake there was some naked babyboomer a half mile ahead, standing on a rock sunning himself, naked of course, so I stopped the kids and waited for him to get dressed. And waited. I called to the dog loudly, trying to be subtle. And waited. Finally I peeked again and he was, ahem, doing himself a huge favor. So I waited a little longer and saw him head off up the canyon, dressed finally. The rest of the trip was swell. We named that spot Naked Hippy Rock. 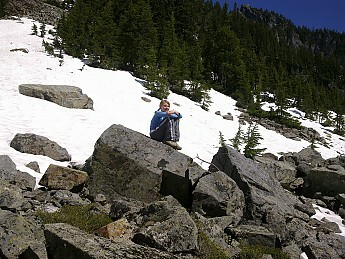 Camping was on snow and the trick is to stay dry but it was sunny and hot so we did fine. Always bouldering to be done. 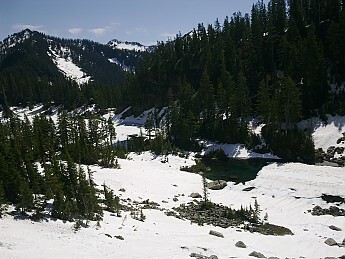 The Lake is 90% covered in snow. 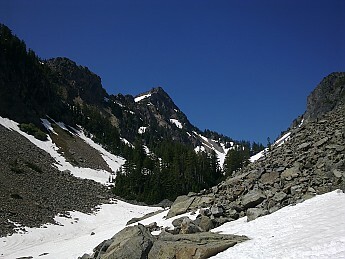 Kaleeten Peak. Meaning to climb it some time. Mud pie factory, they did this four hours straight. If only..
Don't slip on this trail. Denny creek falls. Some 250# naked guy (different one) slid off the upper part and fell about ten feet head first into the upper pool. 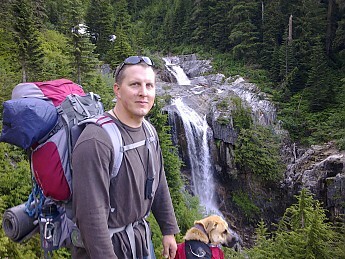 The ranger said he also broke several ribs and spent a few minutes under water. Great photos. Seeing snow gets me all "giddy." I can't wait for the colder seasons here. I can relate to the whole "mud pie factory" thing. I am guilty of burning up hours on end doing just the same thing. Cool trip (naked hippies notwithstanding)! Is I 90 split around the area as east / west bound lanes? Looks like a great trip to me! 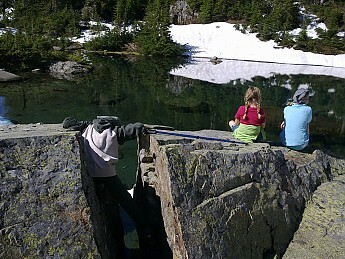 I took my nephew out for his first backpacking trip a few weeks ago- it is really fun taking kids out backpacking.